We have a job opening for a part-time Accounts Payable professional. Are you a Midas Gold person or do you want your business to partner with us in the future? If so, we would love to hear from you. Please fill out our employee and vendor intake form and we will keep in contact with you about job openings and other opportunities. Support Midas Gold. Join our Coalition. We have located a large deposit of gold and antimony in an area in need of extensive environmental repair. Our project can restore the environment and leave the area better than it is today. Read through the plan we submitted to the U.S. Forest Service or other materials. We care deeply about Valley County and since the very beginning we have worked closely with our neighbors to make sure we are designing the best project possible. Take a look to see what Idahoans think about the environmental, economic and community benefits the Stibnite Gold Project will bring to the area. 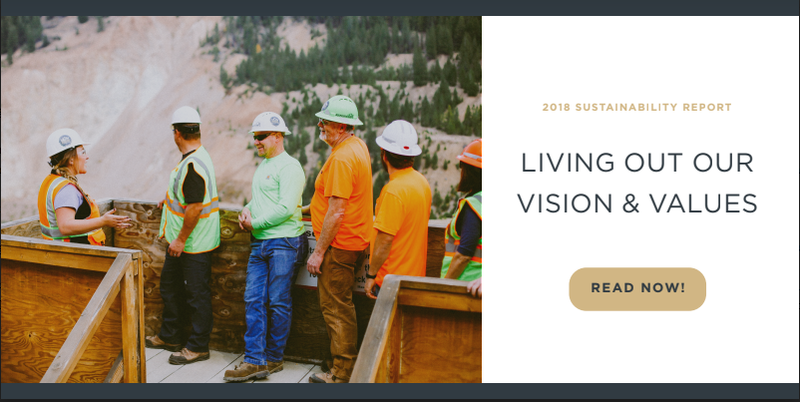 This year’s Sustainability Report is focused around how we put our values into action every day. Read more about a few of our prodest accomplishments of 2018. Click Here to go to Midas Gold Corp.